Egg custards are one of those tarts that some people are really not keen on while others just can’t get enough of them.They make great desserts but are also often eaten in slices, in place of cake, with a cup of tea or coffee. Try following this first recipe, which takes a traditional version of the tart and makes it sugar free. The second recipe presents an extra twist on straight forward egg custard. Use honey as a sweetening ingredient in this recipe. 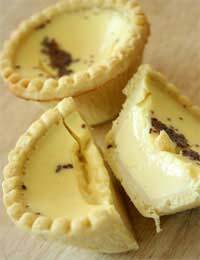 It won’t affect the setting of the egg custard filling, which is essential to the success of the dish. Preheat your oven to 200 deg C/400 deg F/gas mark six. Place your soft margarine in a medium bowl and gently fork in one tbsp plain flour and one tbsp cold water. Mix with your fork until you have a paste. Slowly add the rest of your flour until you have a pastry-like dough. Wrap in cling film and place in the fridge to chill for about an hour. Once firm, grease an 18" tart tin. Take your pastry from the fridge and roll out on a surface that has been lightly dusted with flour. Line your tin and trim off the excess pastry. Pop into the centre of the oven and bake blind for five or 10 minutes, until the pastry begins to turn golden brown. Take a small pan and in it melt your honey. Empty your cream into a large bowl. Add the vanilla essence. Beat your eggs then pour into the cream and whiz with a hand blender. Tip in the melted honey and whiz again. Pour the mixture into your pastry case then sprinkle with nutmeg. Bake until the centre of the filling is firm. It may crack a little but this is perfectly normal. Allow to cool then chill in the fridge. This dish is best served cold. This is an adult version of traditional egg custard. This sugar free version calls for a splash of brandy. Preheat your oven to 200 deg C/400 deg F/gas mark six and follow the recipe for making your own pastry as above. To make your filling, place your honey, vanilla essence and cream in a small saucepan. Squeeze your lemon and grate its zest and add to the mixture. Heat gently and keep stirring until melted together. In a separate bowl, beat your eggs. Pour into the lemony mixture and whiz with a hand blender. Add your brandy and whiz again. Pour into your partly-baked pastry case, sprinkle with nutmeg and bake for about half an hour until the filling is firm.